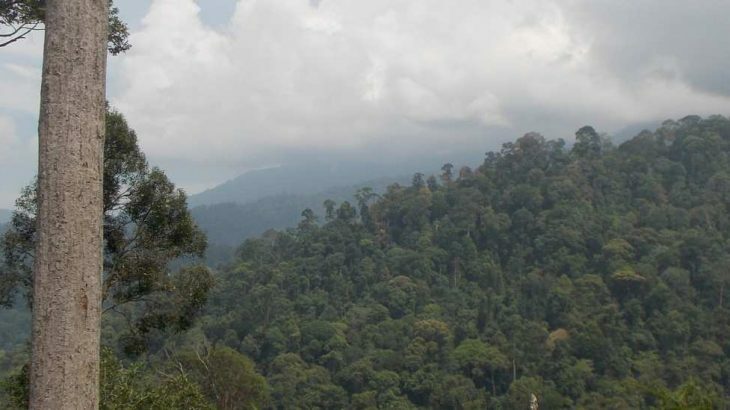 The main trail to the top starts in Ulu Sedim (roughly 110m above sea level), 28 kilometres from the nearest town of Kulim and only 90 minutes from Penang airport. It takes most hikers around 7-8 hours to reach the summit and around 5-6 to descend again. Many local hikers spend three days on the mountain, with 2 nights camping at the picturesque waterfall (800m), but it can also be hiked in two days with one night camping at Taman Bunian (1,555m). Really strong hikers can just about complete the trek in one long day (13 hours return trip with daypacks) if they set out pre-dawn. Very few guides are willing to hike up at night due to the large amount of wildlife on this mountain. Recent trip reports from those bagging Ultra-prominent peaks (Gunung Bintang is just one of only 5 on the Malay Peninsula including Khao Luang in southern Thailand) detail an encounter with a sun bear (‘beruang madu’), snakes, plus elephant droppings and wild boar and ‘large feline’ prints in the mud. The Sumatran Rhinoceros has also been recorded on this range. There are also lots of leeches on this range during the rainy season so wear leech socks if you have them unless you are hiking during January or February. The first 4km follows a cement track which is an old logging road. It is often blocked by fallen trees but guides often provide motorbike transport to where the proper trail begins at the end of the cement – Pintu Rimba (‘forest entrance’, 350m). From here it is approximately 14 kilometres (one way) to the summit. It is just 15 minutes from here to the first stream crossing (355m). It looks like a very slippery log is the only option, but thankfully you can drop down to the right and cross the shallow stream on foot. This is quickly followed by another quite pleasant stream crossing. After this, the trail starts to lead upwards and there is a modest view (440m) on the left. A short while afterwards is another spot to admire the view (600m). After this you will probably see lots of evidence of wild pigs, with muddy prints either side of the trail. Another stream crossing soon follows before you reach what is known as Bukit Tonggek (635m). It should have taken you less than hours to reach this point from Pintu Rimba. Yet another stream is crossed (745m) before you reach the first major landmark which is the shelter and waterfall (800m). It should have taken you between 2 and 2 and a half hours from Pintu Rimba. Previously known as Camp 2, the Sungai Kerian waterfall is incredibly impressive. Many Malaysian hikers spend three days hiking Gunung Bintang, and spend both nights camping here. Despite the deep holes in the concrete floor and the lack of walls, the shelter is idea protection from the rain and there is plenty of space near the waterfall to set up camp. Look out for sun bears and elephants in this area. Beyond the waterfall, the trail starts to get a little steeper. Other than occasional hectometer signs, the next sign is for Bukit Redbull (1,150m) and there are moderate views to the left of the trail. The 10km mark is passed at around 1,420m elevation and the next major landmark is Taman Bunian (‘elves garden’, 1,555m). This is the obvious camping spot for those trying to complete the trek in two days (unless you have time and want to continue all the way to Bonzai Garden or the summit). It should have taken you around 5-6 hours to reach Taman Bunian from Pintu Rimba. There are no real views but it is a pleasant spot and not especially cold at night. Bonzai Garden soon follows (1,605m) and it too would make a reasonable camping spot for one or two small tents. It is followed by a series of minor ups and downs, some of which are made easier by rudimentary ropes. Bintang Kecil (also sometimes called Anak Bintang) comes next at 1,790m after around 75-90 minutes total from Taman Bunian. From here you should see the true summit which lies about 30 minutes away. At Bintang Kecil is the only real junction on the whole trail. To the right is a path up from the southwest at Mahang, but this is much less well-used than the main trail via the waterfall. The summit has good views and the usual summit signs. It is also only one of two peaks in the Bintang range to have a ‘beirut’ (surveyor’s metal tripod) at the top – the other being Gunung Inas (1,801m). The ‘beirut’ on Gunung Bintang has toppled over and is collapsed to one side. There is a rumour this was due to elephants knocking it over but the elephants in this region are likely to spend much of their time much lower down! Occasionally, hikers trek via Bintang South (1,560m) from Sebonton, Perak, sometimes doing a full traverse, but this path is apparently quite overgrown and would require at least one or two extra days. Getting there: The trailhead is about 450km from KL, so it’s much easier to fly to Penang. From Penang Airport to Sedim is around 90 minutes by car. Bukit Mertajam is the closest train station. By car or motorbike, follow signs for Sungai Sedim and then Tree Top Walk. Accommodation: Resorts and homestays available in Sedim to suit most budgets. The area is popular with white water rafters. Penang is only 90 minutes away. Permits: Required from Pejabat Hutan Daerah Kedah Selatan in Kulim, although this process is far from easy unless you live locally or have your guide arrange it on your behalf. RM10 per person. Water sources: Several streams up to and including the waterfall (800m). Some poor quality water available in a hole near Taman Bunian (1,555m) but better to take sufficient supplies with you from the waterfall. Featured, Peninsular Malaysia Kurang Tinggi. permalink. Star Mountain had been quite high on my list for some time, and after reading a few reports from friends and acquaintances it sounded like it would just about be possible to do this in a regular weekend from Jakarta, by flying to Penang first thing on a Saturday morning and back on late Sunday afternoon. Unfortunately I couldn’t find anyone to come with me, and this is a major issue in Peninsular Malaysia, not only because of the high cost of guides (which is affordable when split several ways) but also because Gunung Bintang is known for its wildlife, including sun bears, elephants and maybe even Malay tigers and Sumatran rhinos. This means guides are reluctant to take just one hiker up, especially if he or she asks to hike at night, as I did, thinking it might be possible to avoid the need for camping. There is no shortage of local guides in and around Sedim, but they are not always keen on leading small groups. After a fair bit of messaging back and forth, a pleasant guy called Yus (+60143076809) said he wanted to help but was already taking a big group up the day before. He put me in touch with Anuaq (+60164884408) who said he could help if we camped on the mountain at Taman Bunian. I said I was flying AirAsia with no baggage allowance (for tent and sleeping bag) and he kindly agreed to lend me a sleeping bag and a hammock. Landed in Penang on Saturday at 1015, Anuaq was waiting there and we went direct to Sedim. Only about 90 minutes total. As is often the case in Southeast Asia, Anuaq then told me he would not be hiking but another guy Ying would be my guide. We set off from the little ticket barrier (no idea when this opens and closes) on Ying’s motorbike, turning right up the old logging road that is covered in leaves and small branches. Some folk might be mad enough to try to take a car up here, but a motorbike is a much better option to cover the 4km (only 15-20 minutes). You could of course also walk, but it means an extra hour at least. At Pintu Rimba, the forest entrance, Ying hid his bike a little way in the forest and his friend Angga arrived – nice to see a second guide as I am very hesitant to hike in tiger country in a group of less than 3. The trail was pretty clear and with only a gradual incline – a few minor stream crossings. The first landmark is the waterfall – fabulous, much better than expected. Great spot to camp. This is however a place home to a lot of wildlife – there are reports from 2014 of elephants in this area, and if they have recently given birth then one has to be alert in case hikers are considered a threat and are then charged! This is also the spot where last year one foreign hiker encountered a sun bear. It barked at him and he barked back and it climbed a tree. There are also tons of leeches here, but I was lucky to not meet a single one nor have a single drop of rain – January and February are ideal dry months to hike here. There were a few sweat bees but not enough to be uncomfortable. I would recommend filling up water bottles at the waterfall, as the only later spot is at Taman Bunian but it is not a stream as such – just a hole in the ground as far as I know. The waterfall was where I met the first of the huge local group of hikers who were spreading the hike over 3 days, with 2 days camping at the waterfall and a return hike to the summit in the middle. There must have been about 50 of them, all in yellow t-shirts, and of many different ages. One good thing about this is that the trail was perhaps slightly clearer than it would have been had I not effectively followed them up the mountain. After a fairly strenuous ascent from the waterfall, we camped at Taman Bunian (‘elves garden’) which is the ideal spot if you are doing a 2-day hike. You could do it as a dayhike with a strong guide if you set off before 7am but that would mean staying in Sedim the night before (lots of accommodation eg homestays available) but little chance of flying out of Penang the same day as the hike. It must have taken us about 5 and a half hours up to here. The next morning we set off at 4.30am and were at Bintang Kecil by 5:45am and at the top by 630am. If you live in Jakarta it is easy to forget that sunrise isn’t until 730am here, so we had quite a wait. Sadly a fair bit of cloud around so didn’t get a great view. Had I not had to get back to Jakarta the same day we could have stayed around for another 30 minutes and most likely the view would have been magnificent. I gave the mountain 4 stars as I assume the views are great, but my experience was perhaps 3 stars because of the disappointing weather. Coming back down is much faster and we were back at the motorbikes at 1155am. One of the strangest things I have experienced in all of my hikes in Asia happened on the way down, not long after we had started to descend from Taman Bunian. Ying stopped suddenly and peered further down the trail as if he had seen something. He then gesticulated to Angga who promptly opened his bag and passed him a plastic bag of what looked like 50 or so grey lollipops. He took out 3 and passed the bag back. He then took his cigarette lighter out and lit one and threw it down the trail. It was then I realized these were not lollipops at all. It exploded with a very loud noise. Ying was still preoccupied with whatever he had seen. I asked Angga what it was all about and he simply replied ‘buni buni’ (or maybe ‘bunyi bunyi’). I immediately thought of the word ‘bunian’ from Taman Bunian. Bunian are forest elves, and this mythology is very, very strong in Peninsular Malaysia, especially with the Orang Asli, the original people who tend to live in these rural communities on the edge of forests. ‘Bunyi’ also means ‘sound’ or ‘voice’ in Indonesian (and probably Malaysian), so had Ying heard mysterious sounds of the Orang Bunian, the elves or spirits who are forest dwellers? It was most peculiar and he took it very seriously indeed. These creatures are supposedly responsible for hikers vanishing and for befriending human magicians and shamans. Of course, this is not something that I believe, but it was fascinating to see how seriously these ‘forest spirit voices’ were being taken. So, I didn’t see any major wildlife (or even any prints as there was very little mud given how dry it has been) but I did witness an encounter with the Orang Bunian. Well, the super-fast trail runner Mykhailo made it to the top earlier this month in just 3 hours and 24 minutes! Apparently the first 3.5km is asphalt so that’s easy. Higher up, not possible to run! Anyway, that definitely means it is doable as a dayhike for the fit who set out at first light. Mykhailo almost stepped on a snake and ‘heard some strange voices’!